the synthesis of glucose from noncarbohydrate sources, such as amino acids and glycerol. It occurs primarily in the liver and kidneys whenever the supply of carbohydrates is insufficient to meet the body's energy needs. Gluconeogenesis is stimulated by cortisol and other glucocorticoids and by the thyroid hormone thyroxine. Formerly called glyconeogenesis. The formation of glucose from noncarbohydrates, such as protein or fat. /glu·co·neo·gen·e·sis/ (gloo″ko-ne″o-jen´ĕ-sis) the synthesis of glucose from molecules that are not carbohydrates, such as amino and fatty acids. 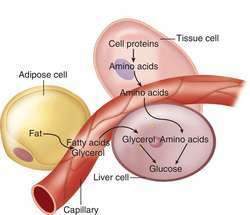 The formation of glucose, especially by the liver, from noncarbohydrate sources, such as amino acids and the glycerol portion of fats. the formation of glucose from glycerol and proteins rather than from carbohydrates. Also called glyconeogenesis. The formation of glucose from non-carbohydrate sources, especially from AMINO ACIDS from protein. GLUCOCORTICOID hormones stimulate gluconeogenesis. the process by which PYRUVIC ACID (pyruvate) is converted to GLUCOSE. This is not the exact reversal of GLYCOLYSIS. Three of the reactions of glycolysis are irreversible and it is in these three that gluconeogenesis differs. In the CELL gluconeogenesis is normally more active when there is little need for ATP. The process meets the needs of the body for glucose when CARBOHYDRATE is not available in adequate amounts from the diet. Non-carbohydrates, such as FAT and PROTEIN, can be converted into glucose, notably in the LIVER and KIDNEY. synthesis of glucose from non-carbohydrate precursors mainly in the liver and to a smaller extent in the renal cortex. Precursors include pyruvate, lactate, glycerol and the glucogenic amino acids derived from skeletal muscle. The glucose-alanine cycle involves the conversion of alanine, formed in muscle, to glucose in the liver; activity of the cycle is increased during the postabsorptive state and in starvation or prolonged exercise, slowly mobilizing glycogen stores and using protein for the maintenance of normal blood glucose concentration. Gluconeogenesis and export of glucose from the liver are promoted by the hormone glucagon, and inhibited by insulin. n the formation of glycogen or glucose from noncarbohydrate sources (e.g., the glycogenic amino acids, glycerol, lactate, and pyruvate) by pathways mainly involving the citric acid cycle and glycolysis. the synthesis of glucose from noncarbohydrate sources, such as amino acids, propionate and glycerol. It occurs primarily in the liver and kidneys whenever the supply of carbohydrates is insufficient to meet the body's metabolic demands or in the rumen by the action of bacteria in well-fed ruminants. Gluconeogenesis is stimulated by cortisol and other glucocorticoids and by glucagon. Formerly called glyconeogenesis. Anti-diabetic effect of sorghum extract on hepatic gluconeogenesis of streptozotocin-induced diabetic rats. 33%, and the increased gluconeogenesis was significantly inhibited. Gluconeogenesis in liver and kidney of common murre (Uria aalge). Akt also phosphorylates and inactivates FoxO1 to inhibit gluconeogenesis. 34] Observed hyperglycemia in current study is attributed to an increase in the level of gluconeogenesis and a decrease in glycolysis, which is manifested by upregulation in PEPCK and downregulation in PK expressions in diabetic STZ rats, respectively. Under normal conditions, gluconeogenesis consumes pyruvate through pyruvate carboxylase. Suppress phosphoenolpyruvate carboxykinase gene will slow down the gluconeogenesis in the liver. This fact occurs because there is no net production of oxaloacetate to support gluconeogenesis since, in this case, fatty acids are catabolized to acetyl-CoA. Thus, it helps to increasing the supply of glucose via gluconeogenesis. In a low glucose scenario, pancreatic glucagon acts on the liver to promote the production or liberation of glucose through gluconeogenesis or glycogenolysis, respectively. Firstly, hypothyroidism can lead to decreased hepatic gluconeogenesis and glycogenolysis.